Man it’s amazing just how many Sio Bibble figures Hasbro has produced over the years! With the release of super-articulated versions back in the Vintage Collection as well as more recent offerings like the six-inch Black Series edition, the breakout star of Episode I has seen plenty of toy iterations. My favorite however remains the OG Bibble, released in 2000 as part of the final Phantom Menace toy blitz. It’s crazy to think it’s been almost 20 years since its release, and even crazier to think we’re just months away from the standalone film, Bibble: A Star Wars Story. I’ve already budgeted for the first assortment of figures, and even though they changed up the design of his Naboo Cruiser, I’m still interested in picking it up. Back to the figure at hand, the original Sio encompasses everything I enjoy about the Episode I toy line. There just hasn’t been the kind of merchandise blitz that came upon us in ’99. I still remember the local Toys R Us staff dressing up in costume to be part of the original Midnight Madness event. While everyone else was hunting for Darth Maul that night, I only had one figure in my sights: Bibble. Unfortunately he wasn’t offered on that first night. Despite this, and from his first appearance in the TPM trailer, I knew the character would stand the test of time. He’s like an action hero who can really turn a phrase: “A communications disruption can mean only one thing: invasion.” BOOM! Speaking of phrases, we got a CommTech chip in the package. Though the hardware hasn’t aged well compared to modern interactive features like Force Link, I still like to bust out the reader on occasion and relive the glory days of buying way too much Star Wars product. It’s like a time machine that reminds me how much time and money I’ve wasted! 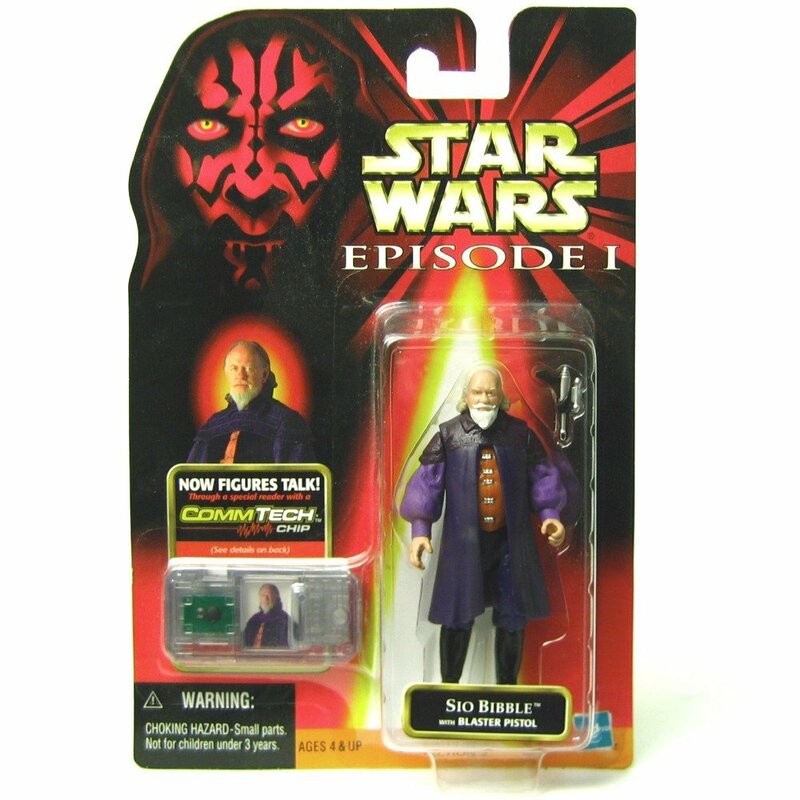 Join us tomorrow as we take a look at the Hot Toy Sio Bibble, complete with articulated eyes, and styleable hair. I can’t wait! Finally, someone’s giving Bibble his due. I can always count on JAD to recognize the TRUE stars of any given toyline. Feldspar next! This guy was actually really hard to find at retail. And, at $20 today, he’s still among the most expensive Ep I figures. I saw him one time and passed on him as I bought a Y Wing instead. Even though I sold that almost right away, I think I made the right choice.